Bet ya you haven’t heard of a bow sight with interchangeable pins as a deliberate design strategy? That’s exactly what the Covert 1-pin bow sight with .019 and .010 pins is designed to be. It’s the first bow sight with quick-change pin technology. Depending on what you’re shooting for the day, you might want to change out your pin to best suit your needs. There’s a small screw in the sight housing that holds the pin in place. Simply unscrew it and pull the pin out away from you on the target side of the sight housing. Insert the other pin and re-tighten the screw. It’s that easy. What if we told you that you could also change the fiber optic pin color as well? Yes, you can do that too. When you insert the pin size you want to use, make sure you slide it over the right fiber optic color you want. Again, it’s that easy. Even with all these features, it’s not a tool-less bow sight, but it does have 2nd and 3rd axis adjustments. This bow sight is also suitable for both right and left-hand shooters. You will have to flip the bracket and reinstall some knobs in place. The Covert one-pin bow sight is loaded as all buyers admit, however, build quality and hardware seem to fall short. Set screws are cheap, you may not get the right size Allen wrenches you need, and pin color is very difficult to see. However, not everyone has this problem. What are the Versa Track Colors? You have the option of choosing between green, yellow, and red colors by sliding the pin into the right colored track. Does this Covert Single Pin Bow Sight have the Detachable Bracket? This model doesn’t have the detachable bracket feature. The more expensive Covert model with the extended bracket is the sight that has the detachable bracket system. Does the Covert 1-pin Sight have tool less adjustments? It does not have tool less adjustments. However, you can make one-hand adjustments to the slide and you do have tool less locking dials. Is the Yardage Tape on the rear? The yardage tape is described as a rear-facing tape, but it’s actually a side-facing tape. What is the Gravity Line Feature? The Gravity Line feature doesn’t get much explanation from Apex Gear. From what we’ve determined, it’s the feature that allows for level and truly aligned shots made from adjusting the 2nd axis. Does the Apex Bow Sight have a Travel Stop? The Covert not only has a travel stop, it’s also been designed to dampen any potential sound that might happen when you return to your zero so you can stay covert. Is a Light Included with the Apex Covert? Yes, an integrated rheostat push button light comes included with the bow sight to offer more pin visibility within three brightness levels. Does the Bow Sight come with Yardage Tapes? As is typical for the Covert Series bow sights, it comes with over 120 pre-marked yardage tapes. However, there have been some common complaints about missing yardage tapes with any of the Covert Series sights. Narrowing things down, The Apex Gear Covert 1-pin bow sight has some great design features. 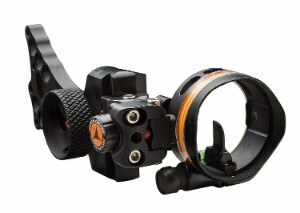 The concept is brilliant, and it works well for most shooters, it even made our list of the best single pin bow sights. However, some of the quality issues may very well be its downfall. For the price, you might have to be willing to upgrade the hardware on your own like some buyers did. But, it’s not the only Covert bow sight to be decked-out with features and for a reasonable price. The Covert Pro sight may not have the interchangeable pin and pin color tech, but it is a sight with dot technology and 11 brightness levels. The built-in reticle has crosshairs that you can see even if it’s not illuminated. It might be worth checking out if you’re willing to explore the advantages of an open field of view and “pinless” technology. Another bow sight with multiple pin sizes is the TRUGLO Hyper Strike. It’s a multi-pin bow sight with 5 pins, so of course it’s different to the single, adjustable pin system. But, the Hyper Strike has a Decreasing Diameter Pin system that has both .019 and .010 size pins in the sight housing. It also has tool-less adjustments, 1.9″ diameter, and it’s comparable in price to the Covert. Not bad, eh? We thought so which is why we also investigated the Hyper Strike in detail as well. Apex Gear knows how to bring innovation to the table. Perhaps their quality control could be improved, but many buyers find the features to be worth the price. To get the latest technology available in the market, a Covert bow sight may be the answer. Trophy Ridge Joker Bow Sight (3-Pin & 4 Pin) - Serious Bang For Buck!